And for that very reason we should NOT eat an onion that has been sitting for a time after it has been cut open. When food poisoning is reported, the first thing the officials look for is whether the ‘victim’ ate ONIONS and where those onions came from. Most probably the ONIONS, are the cause. Onions are huge magnets for bacteria, especially uncooked ones. Please remember it is dangerous to cut an onion and try to save it to cook with the next day, it becomes highly poisonous for even a single night – as it creates toxic bacteria which causes adverse stomach infections because of excess bile secretions and even food poisoning. Why are onions good for me? Onions are particularly rich sources of sulphur compounds (these are also what give them their pungency and stingingly eye-watering capacity) and antioxidant flavonoids, such as quercetin, which protects us against cell damage. Fiddly though it is, try to peel off the paper skin only when preparing, as these flavonoids are most concentrated in the outer layers of the onion. Some research suggests that quercetin’s anti-histamine effect can help ease symptoms of asthma and allergies. Onions are also one of the richest sources of chromium, a metal which increases the action of insulin, and may therefore help control blood sugar levels. High blood sugar levels can ultimately lead to complications including heart disease. As per a study conducted by the University of Guelph, red onions are the most effective in destroying breast and colon cancer cells. 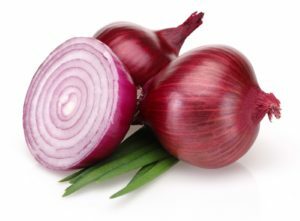 These onions have high levels of quercetin and anthocyanin – two compounds that contribute to this characteristic. Onions activate the pathways that provoke the cancer cells to kill themselves. They make the environment unfavorable for cancer cells to communicate, and this inhibits their growth. It was also found that people with the highest consumption of onions had the lowest cancer rates. The quercetin in onions also has the potential to fight heart disease. It offers both antioxidant and anti-inflammatory properties that promote heart health. Onions are also a part of the French Paradox – they are an important part of French cuisine and are thought to be responsible for the low incidences of heart disease among the French despite their high-calorie diet. Onions can also improve cholesterol levels, and this ultimately benefits the heart. As per a report by the Cambridge University Press, the flavonoids in onions help lower the levels of LDL (the bad cholesterol) in obese people. Onions also prevent the blood platelets from sticking each other, which can lead to clotting and eventually, heart attacks. They also can prevent high blood pressure, thereby averting heart danger. Another study on rabbits showed that onions could prevent atherosclerosis. They achieve this by enhancing fibrinolytic (a process that results in the removal of small blood clots) activity. The digestive benefits of onions can be attributed to inulin, a fiber present in the vegetable. Inulin acts as a food source for the beneficial bacteria in the intestines. Consuming this fiber helps your body maintain good levels of the healthy bacteria. However, the thiosulfinates in onions can cause harm to these beneficial bacteria (as they have antibacterial properties). Onions are packed with vitamins A, C, and E – all of which contribute to skin health. They protect the skin from premature aging that is caused by free radicals. And since the vegetable is a powerful antiseptic, it can also shield the skin from bacteria that cause issues. And by the way, research says that vitamin C is important for imparting a glow to the skin. This onion face mask does the trick – all you need are 2 tablespoons of gram flour, 1 1/2 tablespoons of onion juice (freshly extracted), 1/2 teaspoon of milk, and a pinch of nutmeg. Mix all the ingredients till you get a thick paste. You can add extra milk if the pack becomes too thick. And in case the smell of onions is too much to take, you can add a few drops of lavender essential oil to the pack. Cleanse your face, and apply the mask evenly to your face and neck. After the mask dries (which might take about 20 minutes), remove it by gently massaging it off the skin with milk. This mask not only adds glow to your skin but also exfoliates it. Onions possess enormous anti-aging benefits. The antioxidant vitamins A, C, and E fight against the damage caused by the harmful UV rays as well as prevent free radical damage that is responsible for causing premature aging of our skin. Onion is one of the richest sources of quercetin, the most powerful antioxidant that can keep your skin wrinkle-free. Vitamins and sulfur, on the other hand, protect your skin and keep it soft and supple. The anti-aging qualities of onion can be attributed to the presence of sulfur-rich phytochemicals. Massaging your skin with fresh onion juice helps increase blood circulation and improves the overall appearance of your skin by imparting a more youthful and radiant appearance to it. The antimicrobial, antibacterial, and anti-inflammatory qualities of onion can work wonders on your skin. It is a powerful antiseptic that protects your skin from acne-causing bacteria and other skin infections. Onions can be used in the treatment of acne and pimples. For this purpose, you can mix 1 tablespoon of onion juice or extract with 1 tablespoon of olive oil and apply it to your face. Leave it on for 20 minutes and then wash it off. Apart from topical application, the regular consumption of onion can also give you miraculous results in the case of acne. Certain individuals claim that rubbing onions on your face can give good results. You can probably give it a try and check – there is no harm anyway. And for treating acne scars, you can use onion extract. Onion juice is excellent for getting rid of dark spots and pigmentation. The rich variety of phytonutrients and antioxidants in onion nourish your skin while removing the skin impurities. You can prepare an onion face mask by mixing equal quantities of onion juice and fresh yogurt. You can also add a few drops of any essential oil for a pleasant aroma. Massage your face with this mixture, using gentle circular movements for 10 to 15 minutes. This should be done daily for best results. The number one reason onion juice is good for hair growth is it contains sulfur, which is also found in amino acids. And keratin (an important protein) is also sulfur-rich and is required for strong hair. When applied to the scalp, onion juice provides this extra sulfur for stronger and thicker hair. This sulfur can also stimulate collagen production – which, in turn, aids in the production of healthy skin cells, and, hair growth (by default, treating hair thinning too). Applying onion juice to hair and scalp can increase blood supply to the hair follicles, enhancing hair growth. It can also give you voluminous hair. In one study, participants who washed their hair with onion juice had experienced more hair growth than those who hadn’t. However, more research is required. But then, using onion juice on your hair is not harmful. You can simply massage fresh onion juice into your scalp and hair. Leave it on for 15 minutes, post which you can wash as usual using a shampoo. Onion can work as a great dandruff healer. It can kill the bacteria that promotes the growth of dandruff. And an onion hair pack does the job pretty well. You need onion juice and fenugreek seeds. Take 3 tablespoons of fenugreek seeds and soak them in water overnight. The next day, grind them into a fine paste, and to this, add 2 tablespoons of fresh onion juice. Mix well and apply the pack to your scalp. Leave it on for 30 minutes, post which you can rinse with lukewarm water. Apart from dandruff, onions can help treat other scalp infections as well. Use this remedy for treating scalp infections and enhancing scalp health. This remedy also acts as a wonderful hair conditioner. Even onion paste can do the job. Crush half an onion and make a paste (after adding water). Apply to the scalp. Leave it on for about 20 minutes and rinse with water. In case onions make you uncomfortable, you can replace them with garlic. Simply mix garlic juice (from crushed garlic cloves) with coconut oil and apply to your hair and massage as usual. You can shampoo later. Garlic also works great for hair care. Previous How to lose weight in AST method of treatment ?